Civic Club Trees for Sale Starting Saturday! 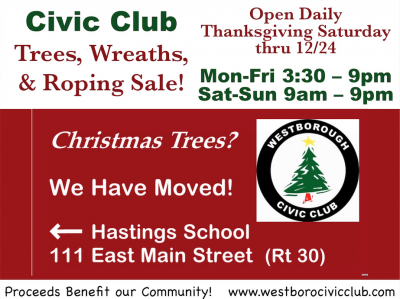 The Civic Club Tree Lot has relocated to Hastings School, 111 East Main Street, (Rt. 30), Westborough after decades at the Tufts Machine lot. The Civic Club was happy to be able support many organizations this past year. The Civic Club provides support to our community through the success of our sale. Proceeds from your purchase will be donated to a wide variety of not-for-profit organizations and individuals in Westborough and the local community.